This waterproof Poncho has been designed to facilitate its ease of use. The velcro fastening neckline and peaked hood offer maximum protection. This waterproof Poncho has been designed to facilitate its ease of use. The velcro fastening neckline and peaked hood offer maximum protection. 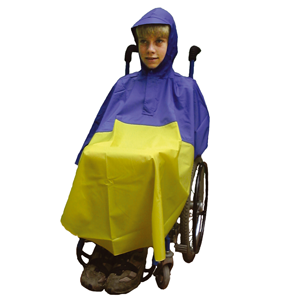 It is available in a choice of three sizes in this attractive blue and yellow design. Small - height up to 3\'3" (1m) Medium - height up to 4\'1" (1.25m) Large - height up to 4\'11" (1.5m).